How can ships run in an efficient and environmentally friendly way? 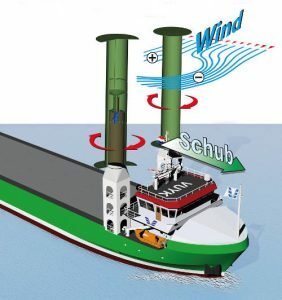 One possibility is to use power of the wind to support the main propulsion system – for example with a Flettner rotor. This type of drive uses the wind to create additional thrust for ship propulsion: a Flettner rotor is a high cylinder that stands vertically on a ship and rotates on its own axis. It is driven by an electric motor. The optimum rotational speed depends on the wind speed and direction. The interaction between rotor surface and wind flow creates a lift force so that the ship receives additional thrust. This not only saves fuel but also emissions. The rotors were already developed in the 1920s, but did not prevail at that time due to the low oil price. However, greater environmental awareness and rising fuel prices have made this type of engine interesting again in recent years. The wind assisted proulsion system was developed by a consortium of 15 partners from the project region under the projects MariTIM and MariGreen at SEC Shipservices. At the beginning of May, a heavy cargo transport from Ulferts-Neermoor shipped the Eco-Flettner rotor to the shipyard’s pier. The rotor is 18 meters high and has a diameter of three meters. The installation on MV „Fehn Pollux“, a 90-metre long multi-purpose freighter, is underway at the moment. The rotor is to be tested on board in practice in order to test its continuous use and to verify the findings on the savings potential. The project is part of the „MariGreen“ cooperation project, in which a total of 65 partners from Germany and the Netherlands are working together in 12 innovation projects on solutions for greener shipping. The aim is to prepare the maritime industry, especially small and medium-sized enterprises, for the future requirements of climate protection and resource and energy efficiency in shipping.